A sister’s eating disorder and descent into mental illness highlight this new memoir about the author’s childhood, released by Dog Ear Publishing. 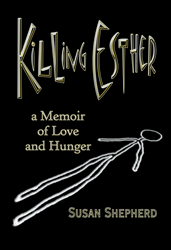 Dog Ear Publishing releases “Killing Esther: A Memoir of Love and Hunger” by Susan Shepherd. It’s not until it’s too late that Susan realizes her sister, Esther, is on a one-way trip of self-destruction and mental illness. (PRWEB) March 18, 2015 -- Life with a sister who wishes she’d been an only child isn’t easy, especially when that sister gradually takes over all the attention in the house. Author Susan Shepherd shares heartbreaking memories of her days growing up in the 1960s and ’70s in New York State with her older sister and brother and distant parents in this new book released by Dog Ear Publishing. It’s not until it’s too late that Susan realizes her sister, Esther, is on a one-way trip of self-destruction and mental illness. “Killing Esther” details rare instances when family members might have made a difference, such as the one day Esther opens up to Susan, wondering out loud if something is wrong with her. Later, Susan realizes it was a missed opportunity to discuss Esther’s emerging madness. Esther begins extreme dieting to lose weight she has no business losing, and by the time she graduates from high school in 1974 she’s become a scraggly-haired marionette with clattering bones. Neither parent seems to accept reality, and hospitalization in a mental facility arrives too late to do more than hasten the inevitable. Author Susan Shepherd, a retired law enforcement officer who interviewed criminals and wrote reports for the court, lives on the North Fork of Long Island with her husband and their three horses and four cats. She is working on her seventh book, “Rah Returning,” which is the fourth novel in The Saga of the Rah series. Shepherd has one brother.